Bob Gordon, National President of the Institute, said: ‘We have experienced similar tragedies to the unfortunate Greek community. We have some understanding of what they are feeling at present and our hearts reach out to them in their time of sorrow. 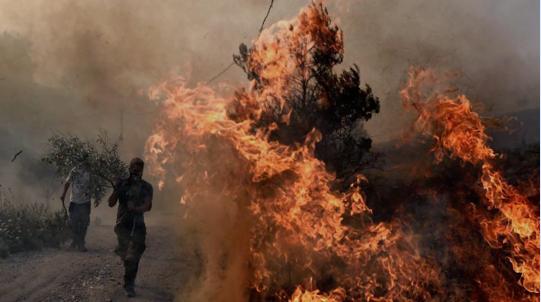 After the 2007 Greek fires, 78 people died, and more than 110 villages were affected directly by the fire fronts. Gavriil Xanthopoulos from Greece’s National Agricultural Research Foundation warned that unless the management of fires in Greece changed then similar tragedies would unfold. Sadly, he was right. A similar number of people have died again this month. Bob notes similarities between ineffective fire management in Greece and the path being followed by Australian politicians and fire agency leaders. ‘The two most disastrous fires, in the past 60 years, have occurred since Greece removed forest fire suppression responsibilities from the Forest Service and handed them to the Hellenic Fire Service (the para-military organisation that carries the responsibility for urban firefighting) in 1998. ‘It makes sense to use people who understand the rural and forest environment for forest fire suppression. That includes foresters working with locals who understand the bush and fire behaviour. ‘We will have fewer catastrophic forest fires if we properly manage the forested estate on both public and private land. ‘Relying upon an ever-increasing number of aircraft doesn’t make economic sense. ‘The Victorian Bushfire Royal Commissioners recommended extensive fuel reduction burning to manage forest fuels in the mountainous forests, far away from urban settlements. Failure to do so will lead to forest fires burning into our cities like they did in Canberra in 2003. ‘Uncontrolled forest fires can have terrible consequences for our environment and, the community’s social, economic and cultural development. ‘It is easy to blame climate change, but we know that successful suppression of “easy bushfires”, and not conducting large scale low intensity prescribed burns in public and private forests, leads to forest fuel accumulation. The more fuel available for a fire to burn, the harder it is to extinguish and the more damage it can do. ‘To give our firefighters some hope of controlling fire in our beautiful forests and water catchments, greater focus on forest fuel reduction burning is essential. ‘The Greek fires reinforce that wildfires will burn through whole landscapes: from forests and abandoned agricultural land into the urban-rural interface particularly rural lifestyle suburbs. ‘Building community resilience is crucial through a broad suite of strategies that, include fuel hazard management, risk-based fire prevention, community and landholder engagement and shared responsibility for mitigation action. ‘In Portugal, politicians have realised their mistake of focusing resources almost exclusively on fire suppression and are now attempting to reverse their approach by providing sound forest and park management and fuel management practices.